Diagnostic Features - Small ants, usually yellowish-brown in colour. Mandibles armed with three or four teeth apically, usually followed by a series of denticulae. Eyes reduced but usually present, close to anterior of head. Sculpture usually of fine dense puncturation. Middle and hind tibiae each with a single pectinate spur. At first sight, the present situation is somewhat confusing. Bolton (1995) provided an extensively revised list for Ponera and Hypoponera with a number denotated as a "new combination" but in many cases the justification is neither given nor indicated. At the genus level, by deduction, it seems that the authority lies in work that was being undertaken by W.L. Brown, or else is an extrapolation from R W Taylor (1967) - as Bolton (1995, 32, 43, 360) noted Hypoponera "raised to genus" and Ponera "Revision of genus: Taylor, 1967". Ponera (given below for comparison) he gave as "Holarctic, Oriental, Indo-Australian, Australasian"and listed some 32 extant species, of which all but four are from the Western Pacific rim. Hypoponera originally was defined by Santschi (1938b: 79) as a subgenus of Ponera; type species Ponera abeillei, see below Hypoponera abeillei) and link). 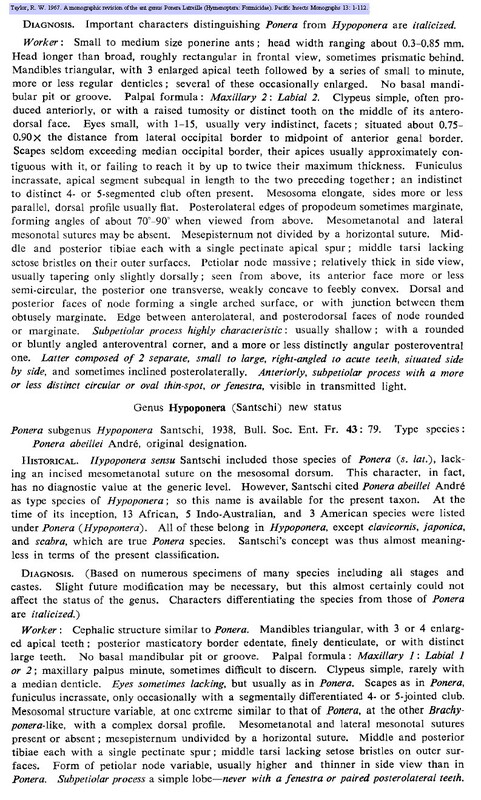 Bernard (1952) recognising Ponera, with Hypoponera as a subgenus, related how Santschi was the first to provide clear descriptions with good illustrations of the workers. Santschi's definition of (subgenus) Hypoponera is at . Taylor (1967a: 9) provided a modern redefinition of the Genus; this is at . Note that Bernard (1952), presumably following Santschi (1938b), separated two subgenera Ponera and Hypoponera on the basis of the presence of a groove or at least clear suture between the mesonotum and the propodeum in the former, and no more than a dorsally visible suture on the latter. R W Taylor (1967a) appears to have decided that this was not valid, as the key defining character he used for separation of Ponera from Hypoponera was the presence in Ponera of a highly characteristic subpetiolar process; usually shallow, with a rounded or bluntly angled anteroventral corner, and a more or less distinctly angled posteroventral one. The latter is composed of 2 separate, small to large, right-angled acute teeth, situated side by side, and sometimes inclined posterolaterally. Anteriorly, the subpetiolar process has a more or less distinct circular or oval thin-spot, or fenestra, visible in transmitted light. This lobe is never present in Hypoponera. R W Taylor affirmed Ponera coarctata as the type species (see below). Bolton & Fisher (2011) had (key) "Eye absent. Metanotal groove absent; in dorsal view the mesosoma surface is not clearly interrupted by a depressed transverse groove between mesonotum and propodeum. Base of the cinctus of the second gastral tergite (Abd. IV) is conspicuously traversed by crowded longitudinal cross-ribs. (Portugal, Spain, France (Corsica), Italy, Israel, Saudi Arabia, Egypt, Tunisia)"
Bolton & Fisher (2011) had (key) "Petiole in profile with anterior and posterior faces only weakly convergent dorsally, so that dorsal length of node is only slightly less than length immediately above the anterior tubercle. Dorsal midline of head with a narrow impression that extends back from the frontal lobes and reaches beyond the midlength of the vertex. Eye small but distinct, far forward on side of head. Cosmopolitan tramp species"